Santa, Lord of the North Pole? It appears that a common phase of conversion to a new religion is to spend time taking old beloved concepts and celebrations and painting them with the brush of the new religion. For whatever reason, followers of Germanic inspired faiths seem to be particularly committed to this habit. The energy and time put into “back researching the roots” of holidays is remarkable. The truth is, it is not really necessary. When a person is confident in the praxis of their Hearth Cult and able to engage in healthy observance of inherited family traditions, there is no dilemma in having a 4th of July BBQ. But confidence often needs boosting. And nowhere does it seem to need it more than in the practice of believing in Santa Claus. Why can’t we let go of Santa? Why is it that Santa brings the biggest gifts? Why is it that someone else gets to have the prestige of being a gift giver when parents are the ones who typically earn the resources that gain the gift? How is it that we are so far removed from the nature of the gifting cycle that even when we try to spin Santa with ancient Germanic names and attributes, it still doesn’t fit right? There is a specific disconnect when it comes to gifting- we instinctively know it is important, but we feel the consequences of getting it wrong. We want the benefits- the smiles, the dream fulfillment, the pride of presentation- but we don’t want the responsibility in case it disappoints. Gift giving is an earned privilege. In ancient times, gifts were tied into social order and communication networks and gifting was the domain of men of worth. Back in the ancient day, when the privilege of gifting was better understood, it was easy to understand if you qualified for the gifting job. Now, we must act on our own behalf instead of relying on a leader to represent our whole clan. For many, that is scary. Modern Santa is a great proxy of the prestige guilt of the current over culture. We are not supposed to be prideful of our wealth, but we just can’t resist lavishing it on beloved children. Santa makes it OK. If the gift disappoints or is not fancy enough, Santa can take the blame. If the resources are not managed well and the gifts are not bountiful, we can say Santa must have made a mistake. If someone looks askew at the overwhelming piles of gifts, we can just smile and shrug and say “Santa was really busy this year.” We can lay a lot at Santa’s feet if we need to. But we just can’t say he works for us in that way. Nope. We have to go and turn Santa into God in order to justify our level of devotion to what he stands for and how he makes magic happen. But is making him the likely patsy for our mistakes, or making him carry the burden of our shame of prosperity and generosity really the way to engage with a God? Certainly, the icon of the “Mysterious Gift Bringer” is common amongst all human cultures. Santa is definitely a character in this ancient tradition. For Heathens, he seems to be assigned to the camp of Woden. When being hammered into the mold of Old One Eye, Santa is seen as the Lord of the Hunt, Sleipnir is the 8 reindeer; the fast ride in the cold winter night is akin to the Wild Hunt, etc. etc. There is only one problem- this narrow view doesn’t fit well. Some people see Santa as Freyr. But that isn’t a good fit either. What would be a better fit? Let’s examine what we “know” about Santa. He lives in a claimed territory in his own “compound” with buildings sufficient to house himself and his family, those that attend to his property and care for his stables, the skilled workmen that produce products at his bidding, etc. . He keeps himself within his walls most of the year to prepare for his special night of gifting. He is partnered with a wife who is regarded in high esteem both by her association with him but also as a woman of her own renown and is known as a caregiver to his elves/people. He manages his resources in order to support his role in the gift cycle. He distributes gifts to those who’s good deeds please him and those gifts act to perpetuate the good deeds into the future. This is not a Huntsman on an insane run. This is a Lord at the High Seat in a hall, a ring giver and a feast host touring his domain. This is not a wild rider raiding and taking drinks to ensure he is supplicated. This is a man in control and at the height of measured and hard earned power. Upon examination, Santa fits the role of a familiar lord in a great hall who rules generously over a known territory. We invite him in even when we are not awake to receive guests. He has freedom of our homes and if there isn’t a chimney for him to use, some houses actually provide him with a special key. Why is the Lord in the Hall- a role not of a God but of a mortal man, a better fit for Santa? The Lord of the Hall is a representative of his Theod/Tribe/Family. He gifts not just for himself, but for his people, and as such, should be openly witnessed in his generosity- not granting largess while sneaking in and out of a dirty chamber. The Lord of the Hall is the primary Gift Giver. He sits at his stool and dispenses gold and treasure to those deemed worthy by their words and deeds. He grants recognition for right good living, He does this directly, in person, in tangible ways. The gifts that he dispenses are reflective of the combined luck and resource management of his people. But which Lord is he? Which Chieftain would you want to welcome into your home, indeed purposefully allow to sneak in while you slumber and hold full freedom of your fire and larder, grant gifts, and enjoy your food and drink without you there to share? Which lord would have a direct personal interest in you and especially your children? Not some madness inducing deity. The chieftain you want to welcome is the one who has an investment in you and yours and already knows the way in. That chieftain is the grand ancestor of your clan. If Santa HAS to be somebody in the Heathen world, then Santa is the Ealdor of our Ancestral Hall. And if Santa is an ancestor, then we need to be honest about how he, and all of our other ancestors really help us. Our individual luck, collectively the luck of our ancestors and Frithweb, is what gets those presents. Be it by cashing in a paycheck or using community connections to receive largesse. Our individual end of the gift cycle is a manifestation of our ancestors, not the results of a personal brush with a madness inducing deity. We can get away with using Santa as the gift bringer if we respect him as the beloved ghost of generations past who gifts on our behalf and on behalf of our lineage. 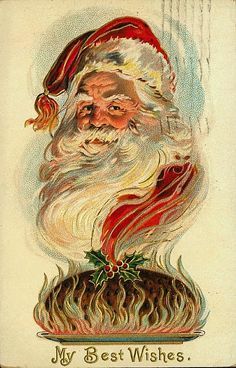 If we must have a historic Heathen analog for Santa (and really, it is not a requirement), we have to look at more than just one aspect of Old One Eye- a much wider and nobler aspect and one that carries far more responsibility and prestige. By cherry picking the exciting and glamorous aspects of Woden for Santa we are simplifying and confusing what is and ever should be a complex example of the social context of the gift cycle. Santa doesn’t really need us to create some forceful narrative in order to work his magic. He does just fine on his own. And even without a costume change to a cloak and tunic, he brings good concepts to children like generosity, focusing on good behavior, and offering hospitality to guests. We need to embrace gifting as a manifestation of our Honor and Wealth as it benefits our families here and now. Thus we need to claim responsibility for what we bestow. Current social standards shrink away from public displays of jovial holiday generosity. It is considered prideful. But having pride about our accomplishments is key to the mindset of people living in a prestige culture. So too do we need to take responsibility for the preferences of our Hearth Cults. We need to embrace that which is important to us, and that which makes us US, and revel in it. If we insist on embracing Santa as a grand Heathen icon, we need to be thankful for the inherited gifts of prestige that he represents. But we need to balance that with proud and grounded gift giving without a fake beard. As important as the ancestors are, we are now what they have accomplished and the gifts we give should be clear documentation for the current generation’s success. Let this iconic figure take up the cherished role of twinkly eyed grandsire from whom our holiday inspired generosity and sweetness originate. Let Santa fill the stockings, but we should create the piles under the tree. Very well written. I have enjoyed reading your work and look forward to more!